​Dangerous myth of 'economic nationalism:' Bannon's deceptions about China & U.S. 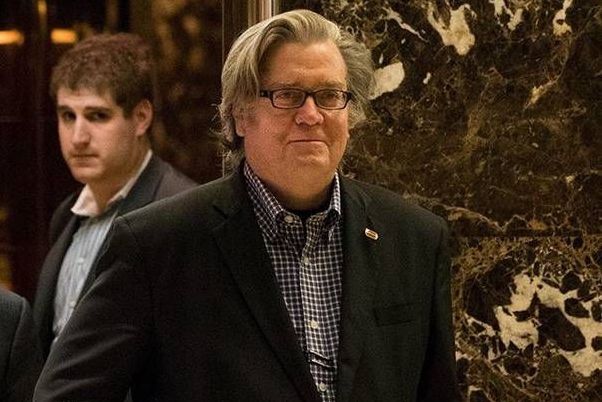 The media executive and political activist Steve Bannon, now no longer a member of the Trump administration, has dedicated himself to traveling across the United States espousing a political gospel he calls"economic nationalism." In his rhetoric, he highlights the shortcomings of the American economy, and offers his unique solution. His rhetoric presents a view of world politics that is potentially damaging to the global community and contain blatant falsehoods. Speaking on December 5 at the"Black Americans for a Better Future" summit in Washington DC, Bannon got agitated about the decline in wages, the opioid crisis, and the real problems plaguing the U.S.
His remarks, broadcast to millions of viewers on C-SPAN, spoke of how much better cities like Baltimore and Detroit would be if the government invested in them, rather than in foreign wars. Many Americans are deeply frustrated, and Bannon's ability to agitate around these, often unspoken, problems make him a popular figure. However, as Bannon's remarks went beyond acknowledging problems to presenting analysis, confusion emerged. He pointed out that many foreign students are studying at American engineering schools. He bemoaned the lack of U.S.-born students in these institutions saying,"It's a huge albatross. It's a total scam. They (U.S.-born students) are no dumber, they need opportunity." No one is saying Americans are inherently less intelligent than people in other countries, but in reality, the U.S. education system is extremely poor in comparison to Western Europe and many other countries. Test scores show this time and again. Students from countries with superior educational systems are often more qualified by the time they apply to universities. The policies of privatization and"school choice" promoted by right-wing activists like Bannon have not improved things, and the quality of American public education continues to decline. The mismanaged and under-funded education system most certainly impacts the number of American-born individuals who work in places like Silicon Valley. It's not a"scam," but a real failure of political leadership. When describing the drop in wages among American workers, Bannon said,"Jobs at McDonalds and Taco Bell are not manufacturing jobs. Think about when St. Louis and Detroit were great. It was manufacturing jobs that made [the nation] great, because in a manufacturing job you can support a family and the community has other money with other services around it." While American industrial jobs do pay higher wages than the service sector, this has not always been the case. During the 1920s, factory workers in New York City, Gary, Chicago and other industrial centers lived in cramped conditions. Beloved American novels like"The Jungle" by Upton Sinclair and"The Grapes of Wrath" by John Steinbeck describe how American workers were treated then. The rise in the pay of industrial workers only came about with the rise of Industrial Unions in the late 1930s. Workers occupied their factories in a wave of"sit-down strikes" in 1937, demanding the right of collective bargaining for better pay and conditions. Detroit's Ford Motor Company and U.S. Steel Manufacturers worked tirelessly to prevent the unionization of their employees, and continue to pay low wages. The policies of the Roosevelt administration, which cooperated with the labor movement and anti-fascist activists, and eventually aligned the United States with China and the Soviet Union to defeat fascism, was essential in creating the industrial middle class. To top off his confused analysis, Bannon presented some information that is blatantly false. In his remarks, he declared that"there was an important speech at the 19th [Communist Party of China) Congress. President Xi outlined in a 68-page speech, lasting three-and-a-half hours, the basic position of China and its position in the world. And, what he said, was this: economic war that they have with the United States of America is essentially over and they won." The full text of President Xi's speech to the 19th Party Congress is available on the Internet. At no point does Xi refer to an"economic war" with the United States. Xi and other representatives of the Chinese government have always said the opposite, favoring win-win cooperation between countries around the world in order to ensure peace and development. Bannon reveals his bias when he repeatedly tells his audience,"I'm a capitalist." His economic vision is essentially tainted by his devout belief in neoliberalism. His"economic nationalism" consists of proclaiming that somehow capitalism and the rule of profits would not create so many problems in America, if only it functioned in isolation from the global economy. The U.S. indeed has economic problems, but the notion of cutting itself off from the rest of the planet is an illusion, and it would not solve the problems he bemoans. If Bannon were to actually read Xi's speech to the 19th Party Congress, not falsely misrepresent it, he would discover a vision that offers a much more realistic solution to the problems he bemoans. The hope for the U.S. is not building a wall around the country, but rather, working together to build a human-centered global economy focused on development and peaceful cooperation. Caleb Maupin is a journalist and political analyst who resides in New York City focusing on U.S. foreign policy and the global system of monopoly capitalism and imperialism. Former Trump policy guru Steve Bannon is now preaching a toxic political gospel that is totally insular and in sharp contrast to the broad vision of President Xi Jinping.